Iraqi forces regained most of a key oil refinery Saturday that ISIS militants had taken over earlier in the week, according to a senior Iraqi security official. The official told NBC News that troops from the Iraqi Federal Police and quick reaction forces arrived in the oil refinery city of Baiji, situated about 25 miles north of Tikrit, on Friday night and were able to take control of much of the complex by Saturday. The Iraqi forces killed about 50 militants in the attack and destroyed some of their vehicles, Iraqi sources said. “We expect to regain full control within a couple of hours,” Sabah al-Noamani, a spokesman for Iraq’s counterterrorism forces, told Reuters. Iraqi forces had already taken the refinery back from ISIS forces in November, but the militants took it back again this week by blasting through the security perimeter. ISIS fighters and pro-goverment forces battled for a year over control of the oil refinery at Baiji, Iraq's largest. The plant was crippled but intact, and would have been a key asset for whomever came to control all of the refinery and the pipelines in and out of it. This weekend, ISIS forces, which had controlled much of the facility since April, suddenly retreated. And torched the place on their way out. The sabotage occurred just as pro-government forces secured key roads to the refinery and launched fresh attacks on ISIS defenses. When the Baiji refinery was operational, it processed more than 200,000 barrels per day of crude, "which," says van Heuvelen, "amounted to more than one-third of Iraq's total domestic fuel production." Iraqi authorities took the facility offline in June 2014 when ISIS forces first seized great swaths of northern Iraq, including oil fields and pipelines critical to the Baiji operation. With ISIS essentially surrounding the refinery, the pro-government forces had to struggle to keep fighters out. "Now," says van Heuvelen, "the refinery is probably unusable for several years, if ever again." Iraqi officials might have seen this coming. Despite Iraqi statements the city of Baiji is free from ISIS, the United States believes only about half the town is in Iraqi hands, according to a U.S. official with access to the latest intelligence. Following footage from Baiji battlefield, the video cuts to the execution of 11 oil refinery workers dressed in the iconic orange jumpsuits of condemned ISIS prisoners. Raw footage recently posted on Twitter allegedly shows supply crates and parachutes that the US delivered to Islamic State militants while they were in control of Iraq's largest oil refinery. The video caused an uproar among Iraqis, some of whom believe that Washington is supporting the brutal group. The footage was published by Hayder al-Khoei, an associate fellow in the Middle East and North Africa Program at Chatham House. Titled 'US supports ISIS,' it is said to be one of many similar videos circulating on the internet. The recording, reportedly made at the Baiji refinery, shows an unidentified man speaking in Arabic. He asks the person shooting the video to film everything he sees around him. Pointing at what appears to be a parachute, he says that it was sent by Americans to the Islamic State, also known as ISIL/ISIS. The man adds that Americans delivered weapons and food to the Baiji oil field after it was seized by extremists. Another 'U.S. supports ISIS' video going viral in #Iraq. Parachutes & supply crates in Baiji refinery. 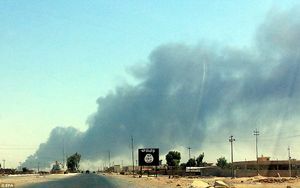 The US-led coalition against the Islamic State has stuck parts of the Qayyarah Oil Refinery in Iraq that the terrorist group used to acquire illegal oil revenue, Combined Joint Task Force — Operation Inherent Resolve spokesperson Col. Christopher Garver said on Friday. "This airstrike is aimed at reducing Daesh's [Islamic State’s] ability to fund their terrorist activities with oil stolen from the people of Iraq," Garver stated. The spokesperson explained that the Islamic State terrorists used the Iraqi oil refinery to produce oil and sell it on the black market. This page was last edited on 28 October 2015, at 00:52.